NEIL Silke calculated that it was worth taking the risk of leaving his day job to develop his idea for a new letterbox that could handle parcels securely amid the rise in online shopping. He had spent his lunch hours, evenings and weekends on his design while working full-time in project management and technical sales for an engineering and manufacturing company. In late 2012 he left his full-time job to devote most of his time to the parcel letterbox, taking on part-time work to pay the bills. Now he has set up a company, Deliver-Eze, and is working full-time on commercialising a product he believes has a global market. 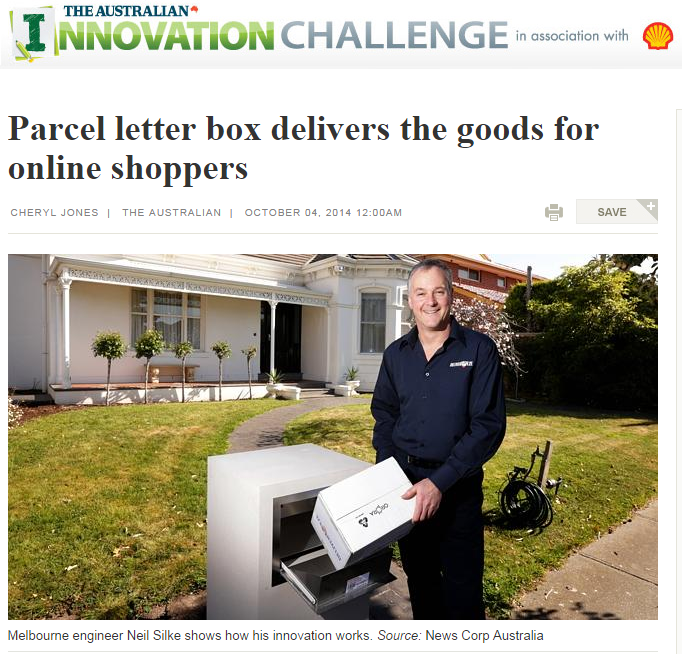 Silke, of Melbourne, has made the finals of the Backyard Innovation category of The Australian Innovation Challenge awards with the Deliver-Eze parcel letterbox. The awards are run by The Australian in association with Shell with the support of the federal ­Department of Industry. The Backyard Innovation category is open to the public and carries a $10,000 prize. Silke says couriers often make several attempts to deliver parcels before finding someone at home to accept them. Parcels are often left on the doorstep, raising the risk of theft, or at the post office, forcing householders to make the journey to retrieve them, he adds. Silke has designed three variants of the letterbox, most of them made of steel. One type integrates into most new and existing fences while another is designed to be bricked into masonry. These variants are manufactured in Australia. A third variant — a stand-alone pillar for homes without fences — is made in China. “We would like to keep as much manufacturing as we can here if possible,” he says. The letterboxes can accommodate packages measuring up to 325mm by 315mm by 225mm. Their common feature, the intellectual property at the heart of the design, is their security mechanism. There are patents pending in several countries on the mechanism. They have an internal blocking flap which is linked to the letterbox’s front door. “As you open the front door, the flap moves forward, blocking access to the parcel storage chamber,” Silke says. The parcel falls on to a shock absorbing mat in the storage chamber. He says the mat would allow a carton of eggs to be deposited without breaking them. Householders open a lockable door at the rear of the letterbox to retrieve their parcels. Each letterbox has a unique bar code that couriers will be able to scan as proof of delivery. After completing a bachelor of engineering degree at the Royal Melbourne Institute of Technology (now RMIT University), Silke worked for Holden as an engineer for about 16 years. He eventually shifted his focus from the car industry to other parts of the manufacturing sector. “I could see the writing on the wall,” he says. The experience he gained in the automotive sector has been critical to his latest enterprise. “There are a lot of engineering principles in this design,” he says. Silke chose materials that would be durable and minimise corrosion and worked hard to optimise the design to maximise the size and number of parcels that could be accepted by the letterbox while minimising its size. “This allows you to have something that takes decent-sized parcels but can still be integrated or hidden away,” he says. He did extensive benchmarking to assess competing products on the local and global markets. And he consulted fencing contractors, bricklayers, manufacturers and householders to ensure the product would work “in the real world” and meet the needs and tastes of consumers. Silke is now focusing on marketing the letterbox and is in talks with big builders on the incorporation of it in their designs.